This is the "before" wall color that we have been dealing with in our living room for several years. I had wanted a warm orange but this shade was just not right. It screamed at me every time I entered the room. It was not quite the tame color you see in this photo. 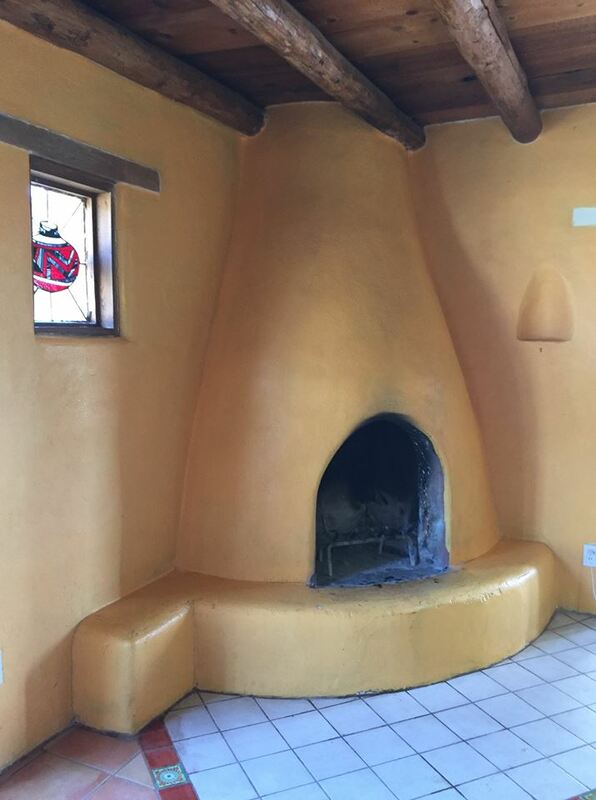 But the room had been really hard for me to paint five years ago and involved a lot of ladder work and tiny brushes taped to long handles to reach over the belly of the kiva fireplace. Time and arthritis have marched along since then and I wasn't sure I was up to all that climbing up and down. But that formerly lovely-sounding Tangerine color kept on shrieking at me, day after day. with a little nicho (niche) for displaying santos (carvings of saints) or other artwork. 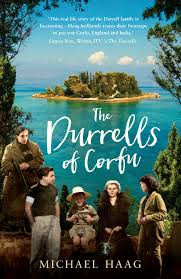 Then I watched The Durrells in Corfu on PBS Masterpiece Theater. I had to keep pausing the show to take photos of the screen. The colors of the water! The colors of the upstairs bedrooms! When I began to dream in teal I knew it was time to get out my old nemesis, the ladder. This is the book [with a slightly different title] about the TV series. It's the hottest time of the year here in the desert. I figured that I could put on an ankle brace and some scanty painting clothes (never to be seen by anyone else) and manage two or three hours early each morning before I tired out and/or it got too hot. And that is what I did. I am in love with the results. The velvety deep color seemingly changes from hour to hour as the light hits it differently. It's hard to explain the feeling of comfort I get from stepping into this room. It is cooling on a hot day and I feel like I'm floating in the Aegean Sea. Another Oaxacan carving stands in a newly-refurbished little cabinet. I think this little bird is looking at the other side of the room, which is still that Tangerine color. Have patience, little bird. "Keeley Hawes (Upstairs Downstairs) stars as an intrepid widow who decamps from dreary England to a sun-dappled Greek island with her four recalcitrant children, ages 11 to 21, on this adaptation of Gerald Durrell’s My Family and Other Animals and its two sequels. Alongside Hawes’ matriarch Louisa Durrell are eldest son, Larry (Josh O’Connor), a budding writer on his way to becoming the famous novelist Lawrence Durrell; son number two, Leslie (Callum Woodhouse), an impulsive firearms enthusiast; daughter Margo (Daisy Waterstone), sixteen and man-crazy; and eleven-year-old Gerry (Milo Parker), who only has eyes for wildlife and grew up to be a world-renowned naturalist."